The Army may be “strong,” like its motto, but it has a weakened brand in terms of marketing itself to service-age youth. The problem facing the Army is that willingness to serve is dwindling, even though the public appears aware of the opportunities offered by military service. It is a sign that the value of the Army isn’t understood, and a campaign is under way to do something about it. In what the marketing world calls “rebranding,” the Army has launched a two-step initiative that first demonstrates its value as an institution and then promotes the value of service. The fundamental shift in marketing, communications and recruiting requires some strong advocates, with the ambassadors of choice being smart, culturally attuned and tech-savvy soldiers and veterans. Since October 2012, the Army Marketing and Research Group (AMRG) has worked to address the marketing changes required to demonstrate the Army’s value to American society. It has studied evolutions in corporate marketing strategies that improve the connections between a brand and the American public, and this year, AMRG will fully implement these lessons under the “Enterprise Army Brand.” A marketing campaign focusing on social media is in the works and should be ready for launch by October. Historically, the Army’s method of marketing and recruiting informs people what benefits a recruit may receive in exchange for his or her service, but not why they should be interested in the first place. The Enterprise Army Brand introduces a fundamental shift from promoting the personal benefits of Army service to promoting the value of the Army as an institution. As a cornerstone of the Enterprise Army Brand, AMRG will highlight the stories of soldiers who make significant contributions to their communities and provide a tangible demonstration of the value of the Army to American society. 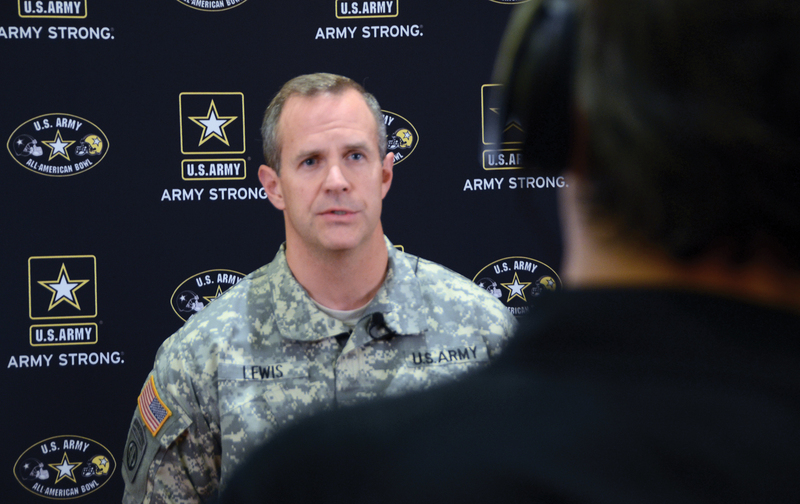 Army marketing and communications activities must continually adapt to keep pace with a rapidly changing environment, specifically, social media and information technology. Social media enabled by information technology (simply referred to as social media for the rest of this article) has fundamentally altered how people gather and evaluate information about purchase and service decisions. Amazon, eBay and Angie’s List are examples of the power of social media: People leverage other people’s experiences and assessments of products, sellers or service providers. Feedback generated from social media reviews is generally regarded as unbiased and trusted more than information found through corporate information sources. Positive reviews, called advocacy by marketers, are often the first and only source of information for Americans looking to purchase a product or service. Understanding how to market the Army requires understanding the Army’s “product,” which is soldiers. Regardless of the length of their service, soldiers have been ambassadors of American values and have served their communities for the last 239 years. Finding positive examples of the Army’s value to society is fairly easy. Sharing the stories of soldiers who serve their community connects America to tangible societal benefits that the Army offers. The Army must foster a positive relationship with the public, and sharing soldiers’ stories is one of many steps on that path. Telling soldiers’ stories—and encouraging them to tell their own stories—is important for several reasons. First, it functions as word-of-mouth advertising. It provides people who are interested in the Army with a close approximation of direct, unbiased experience without committing to service. Second, it conveys a sense of transparency about the Army and Army lifestyle that is unmatched through commercially produced media. Third, it fosters a connection to the public through grassroots communications between soldiers and the public. 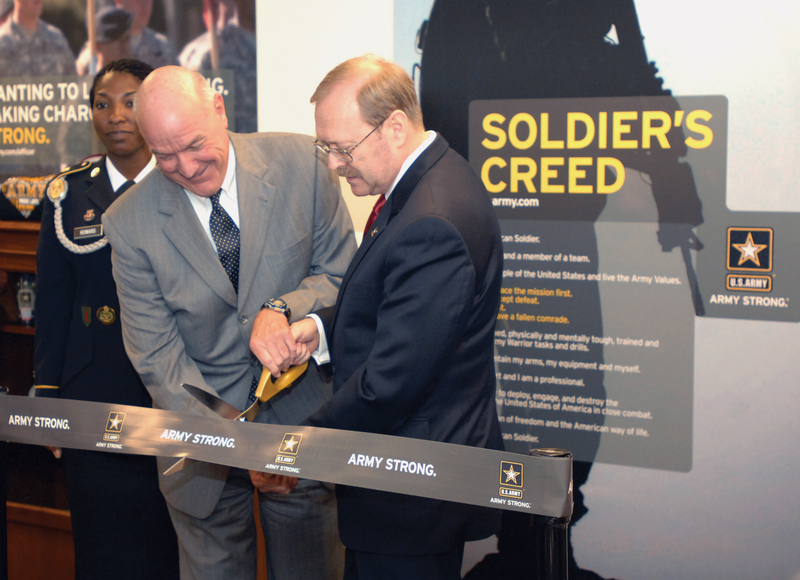 Then-Assistant Secretary of the Army for Manpower and Reserve Affairs Thomas R. Lamont, left, and Deputy Assistant of the Army for Marketing Mark S. Davis officially mark the fully operational status of the Army Marketing and Research Group in 2012. At present, the Army relies primarily on traditional media to promote the value of Army service and prompts American youth to seek more information from recruiters or GoArmy.com. This method has its limitations, however, and must be supported by a coherent social media campaign to be effective. Recent estimates suggest that up to 58 percent of American youth are connected with a military veteran through social media. American youth are probably better connected to the Army than at any other point in history. Although the Army has a significant online presence, this connection to the American public through Army veterans remains largely untapped by marketing and recruiting. While Army recruiters and GoArmy.com remain the most valuable sources of information for American youth exploring Army service options and benefits, the most trusted sources about the Army lifestyle and quality of life are Army veterans. It is reasonable to assume that information from GoArmy.com and recruiters is validated by a veteran’s review. Veteran advocacy via social media can promote transparency about Army opportunities, experiences and lifestyle, supplementing traditional media. Considering the increasing control the American public has over the information they receive, reviews and advocacy are critical. This means Army marketing must not only promote positive reviews but also demonstrate how the Army addresses institutional challenges. Communications specialist Sgt. 1st Class Matthew R. Lewis, 10th Special Forces Group (Airborne), Fort Carson, Colo., interviews with a local media outlet in San Antonio, Texas, while mentoring students during the Army’s All American Bowl week in January. Corporate America recognizes the power of social media when it comes to two-way communications with customers and, ultimately, promoting advocacy. Several years ago, as part of a larger crisis in the American automobile industry, Ford Motor Company was losing ground because of perceptions of poor quality and value. After it reengineered its entire product line, Ford broke away from pre-Internet marketing methods to communicate the value of its product through social media. It rebuilt its image by connecting Americans with Ford drivers. Advocacy through customer testimonials directly reflected the increased confidence in the Ford brand. In the dust and dirt of the North African desert, a weary and haggard British soldier aims his recoilless rifle at a tank passing in front of him. Just before he squeezes the trigger, his tired eyes fall upon a simple white star painted on the tank’s turret, and he is filled with relief. The U.S. Army is here, and hope has come with it. The white star was originally designed as an anti-fratricide marking for vehicles, but it soon became America’s national symbol. During the course of World War II, this symbol became synonymous with America and the Allied cause. For generations of Americans and their allies, when problems seemed truly insurmountable, the white star meant America was bringing a fix, courtesy of the U.S. Army. By the 1990s, the national symbol faded in prominence when the Army began painting it as 4-inch black stars on vehicle bumpers instead of white stars on the hoods and sides. To connect the modern, technological Army with its past, the colors black, white and yellow—representative of the components of gunpowder: charcoal, saltpeter and sulfur—were eventually applied to the star as homage to the heritage of the Army. 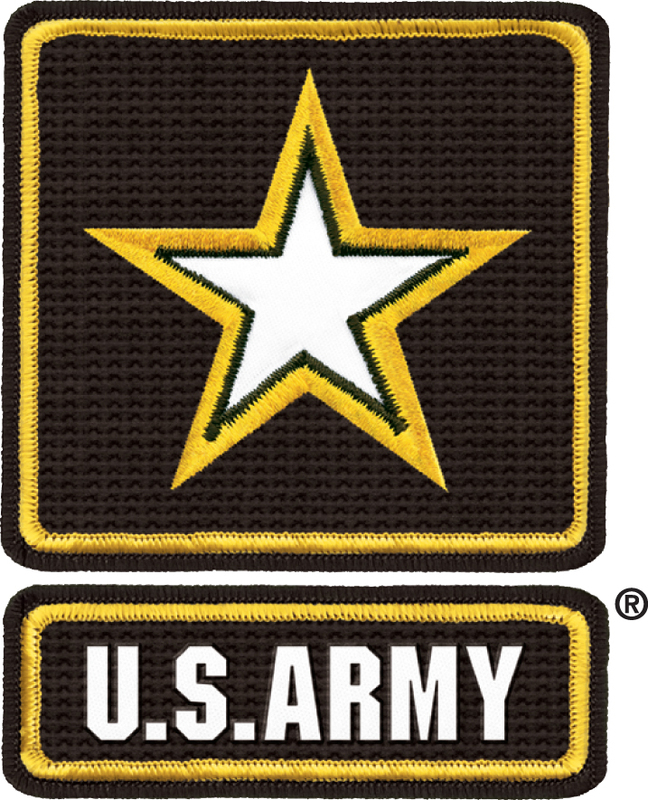 Not only did this design appeal to younger generations, but in 2006 it was adopted as the official U.S. Army logo. Today, the Army Star is one of the most recognizable logos in the United States—more recognizable than the U.S. Marine Corps’ eagle, globe and anchor, and the U.S. Air Force’s Hap Arnold wings. 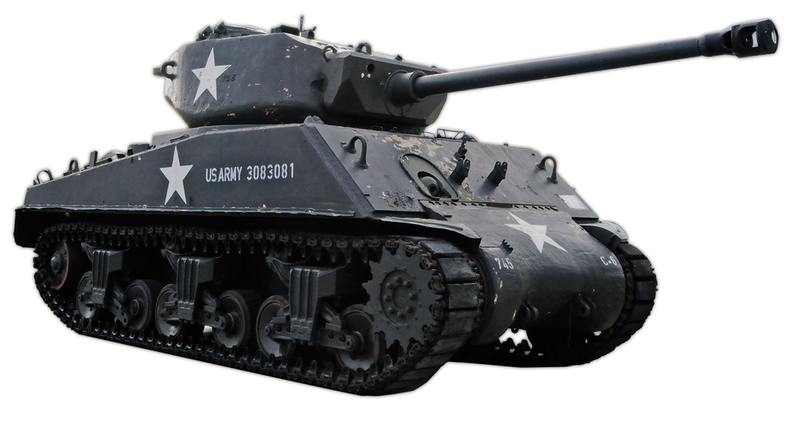 Americans associate the Army Star with the U.S. Army and America. It invokes the same feelings of pride, strength and hope as the national symbol of the past. When the nation and its allies have problems that they cannot fix, they turn to the U.S. Army. For decades, the Army has been the symbol of America’s strength and resolve, and the Army Star is the first reminder of that role. Companies and institutions reap the benefits of advocacy from social media reviews by using them to identify customer concerns and, in turn, address them. British Petroleum turned one of the greatest ecological disasters in history into a marketing message designed to show its ability to learn from past mistakes. Domino’s Pizza used marketing and social media to demonstrate its interest in increasing customer satisfaction through openness and transparency. Its campaign of “disruptive honesty,” as one source described it, reversed two-and-a-half years of negative sales as evidenced by a posting of 14.3 percent improvement in one year. Providing coherent themes to Army advocacy requires close cooperation among marketing, communications, the recruiting infrastructure and the Army itself. Synchronizing these efforts is difficult, but the Army never stops overcoming challenges. Over the last 14 years, we simultaneously fought three counterinsurgencies, conducted civil affairs missions in seven African countries, continued peacekeeping in the Balkans and the Sinai, and supported Colombian counterdrug operations while restructuring our combat forces three times. There is no doubt the Army is, and continues to be, a core strength of the nation and undeniably a valued institution. While a flyer or TV commercial can help generate interest, little can drive the message home as well as veterans’ advocacy. To shape the Army of the future, we must connect America to our best advocates and trust them to demonstrate our value to society by sharing their stories. Army leaders must encourage soldiers to share their stories through social media and other online resources that youth use to make career and life decisions. We must encourage parents to share the personal and professional growth of their sons and daughters because of their Army experience. Commanders must seek opportunities to support local events that bring together the American public and soldiers to showcase the creativity, intellect and versatility of soldiers. Creating a grassroots connection to the American public will demonstrate that the Army is truly a great place to grow, learn and advance. Mark S. Davis is the Deputy Assistant Secretary of the Army for Marketing and the Director, Army Marketing and Research Group (AMRG), at the Office of the Assistant Secretary of the Army, Manpower and Reserve Affairs. Maj. Eric Balough is a consumer market analyst in the Directorate of Research of the AMRG. Lt. Col.(P) Nick Wittwer is a marketing assessment analyst at the AMRG.